You'll get an email every Wednesday with recommendations for two worksheets to complete that week (one English, one maths). Or, if you prefer to set your own pace, work through the worksheets below in the order you wish. We'll also send you a further 24 fun worksheets during the school holidays! For more information, we'd recommend you read Year 1 Maths: what your child learns. Don't forget! We have a whole section of the site about Year 1 Maths where you'll find even more articles, games, worksheets and activities. Maths revision – the fun way! 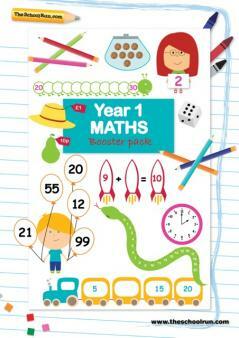 Our Year 1 maths booster pack covers all the main maths topics your child will learn in the first year of KS1 to help them practise their skills. Use the colourful worksheets to boost your child's confidence with number bonds, telling the time, simple addition and subtraction and first story problems, or try some of the suggested extension activities to consolidate what they've learned at school. Feeling confident about all aspects of money is a fundamental life skill, and it’s all about applying mathematical knowledge to pounds and pence. From simple addition and subtraction to division, multiplication and decimal calculations, help your child practise their money maths with games, activities and worksheets, as well as teachers’ tips to support financial learning at home. But beware – you might have play shops (a lot! ), as well as rewarding calculator challenges with pocket money bonuses!. "He had problems counting up in twos, fives and even tens"